Message from Co-Founder, Shiloh Sophia about Art, Christchurch and what you can do to support two artists on the ground…painting night and day on a mural of intention, healing and community. Plus a letter from Jonathan McCloud to the community. Thank you for pausing with me to give awareness and honor to the 50 lives lost in Christchurch, NZ. I know you have so many things you are working on and focusing on and sending love and resources to. I know I do. So thank you for your time to check this out. In just a day of returning from New York I find myself in a community in crisis. Not every person, not in every way. But it is big, feels like a mountain of pain. I wanted to let you know in advance, this letter has typos. It is not the polished request of a seasoned NGO – but the immediate response to a need. So forgive the typos and thank you to Annette, Kate, Sarah and Jonathan for responding asap to my call for action, now. There is a lot going on. We have community members with partners dying. Family members in health crisis with test after test and no results to back up what they are feeling. Local community without resources to make ends meet. Global community with children in the hospital. Many of us feeling sick and not sure why. Our waiter for lunch needing counsel on how to talk to his mother in law about the child coming into their life. What I learned that breaks my heart at UNCSW about women and girls. Then there is the whale that washed up with 100 lbs. of plastic inside that I can’t get out of my mind…and then…you face it everyday. My direct community are on the ground in New Zealand making art in the midst of the country’s first terrible senseless shooting. Something the US is quite familiar with unfortunately. They are making a grove of trees…you can read about it below. For a few years I have been making ‘marks’ in my paintings for the lost, and this week my community, teachers of my Intentional Creativity method are there, making marks for the lost lives on the Grove of Intention – painted murals designed to support and uplift the community. Like I said, I know you have a lot you can focus on and because you are connected with me and Intentional Creativity, I am asking you to focus on this. Are these women going to survive this experience? Of course. And do I want to show them how important art is in the middle of crisis – and how much it matters to us, I sure do. Can I personally fork out the cash to cover what they need right now, yes I could, even after a financially taxing trip to NY for two weeks on a mission which we personally finance. I am trying new things with the mindfulness of our NGO status – I am asking you to work with me to make sure these artists on the ground not only feel our support energetically but through our resources. We want to cover their materials and food for the project. Do that here now to show your support. $5 or $10 or as much as you are called to. Your donation is tax deductible. That is why we created an NGO – to support the arts. This is that call to action. You can get a tax deduction and 100 percent goes directly to the artists. We are sending funds in advance and will reconcile post funding. We have already sent funds, will you join us here? The project was funded by NZ – but the budget has run out and is taking way longer to complete due to weather, tragedy, and sadly, graffiti. Imagine during this crisis, to have your art in process, defaced. Sigh. So much to learn as humans huh? Here are these wonderful women, whom I have known for over 5 years – and worked with over and over in serving our community. Rosie Mac, Kerry Lee, we love you. It is my first work day after two weeks in New York at UNCSW and I have all kinds of things to share with you but that has to wait, Kerry, Rosie and Christchuch come first today. Please take the time to learn why the Grove of Intention matters to all of us and to a country in crisis. Art doesn’t save the world, but it does help save our minds and hearts when we don’t know where to turn. 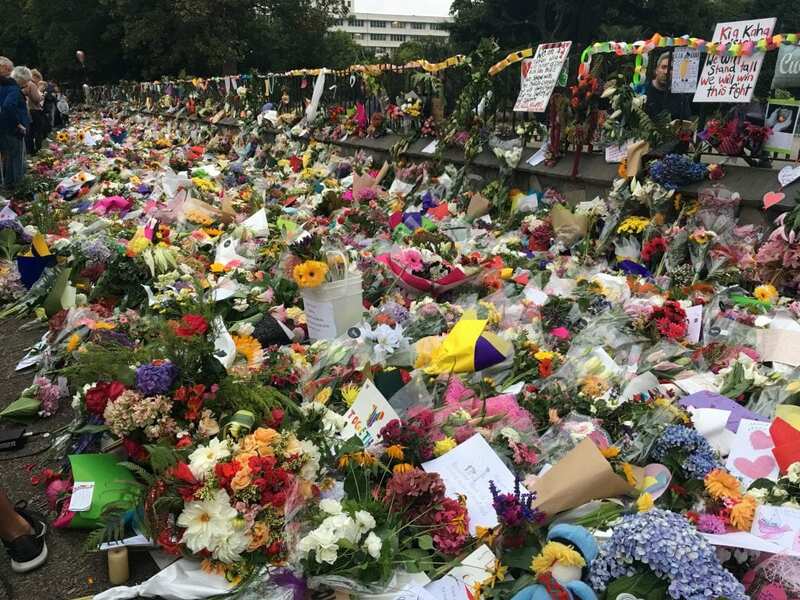 Intentional Creativity Teachers, Kerry Lee and Rosie Mac, are currently working on ‘The Grove of Intention’ project in Christchurch New Zealand, where the mass shooting took place just last week. As you can imagine, creating something like this at a time filled with so much sorrow and devastation is important healing work. Kerry and Rosie are doing all they can to bring public awareness to this project and are asking for any support we can give. We are including the press release here with more information. If inspired, there is a link for you to donate financial resources, which will support the completion of this project in time for the unveiling Saturday March 23, 2019: 12 – 3pm at 145 Westpac Lane in Christchurch. ALL ARE WELCOME and there will be interactive activities with the Grove of Intention trees. Donate NOW to cover resources for our IC Member artists on the ground in NZ – all donations will go 100% to the artist’s cause, and are tax-deductible. Give what you can, even $5 as each donation is connected to exponential energy. Let’s let Kerry Lee and Rosie Mac KNOW we are behind them. Thank you in advance for your presence in our community. We are so grateful for any support you can give – prayers and good thoughts included. 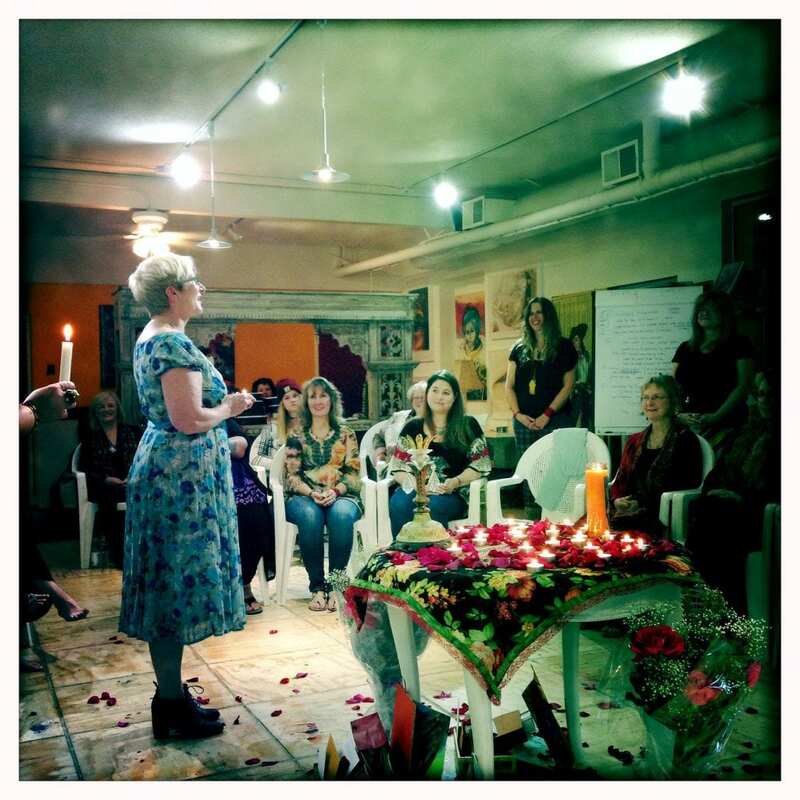 On the left, Rosie in 2015 during the Color of Woman Intentional Creativity Teacher Training, visiting from NZ, photo by Brunehilde Yvrande. 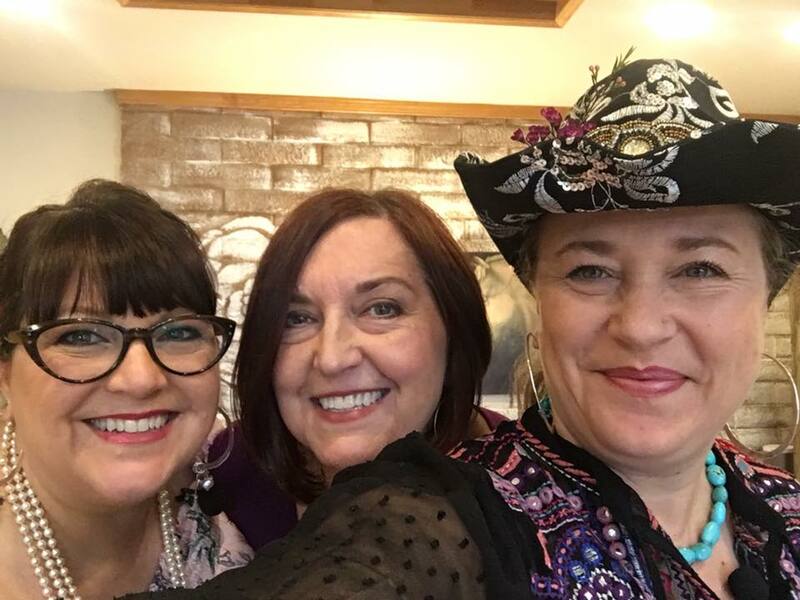 On the right, Dr. Mary McCrystal, Kerry Lee and Shiloh in 2017, teaching during the Red Thread Guide. 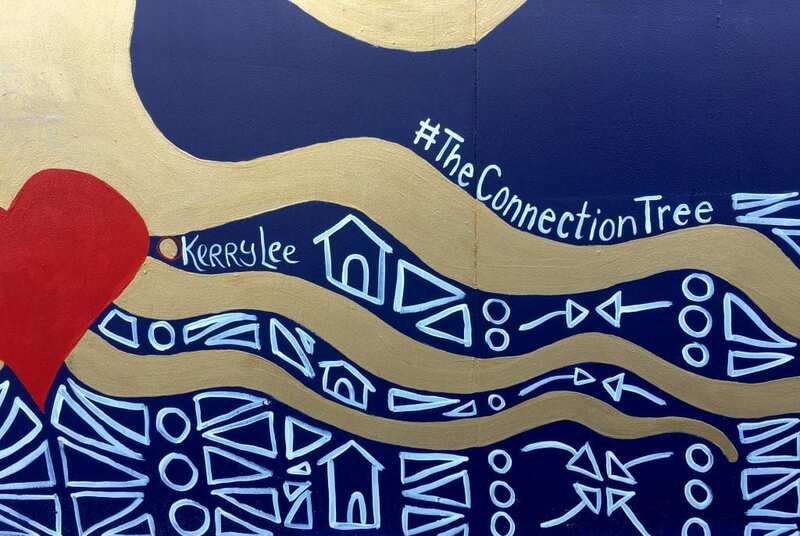 Christchurch, New Zealand: The Grove of Intention, an experiential mural for healing, contemplation, connection, and community is being created in Christchurch Central. 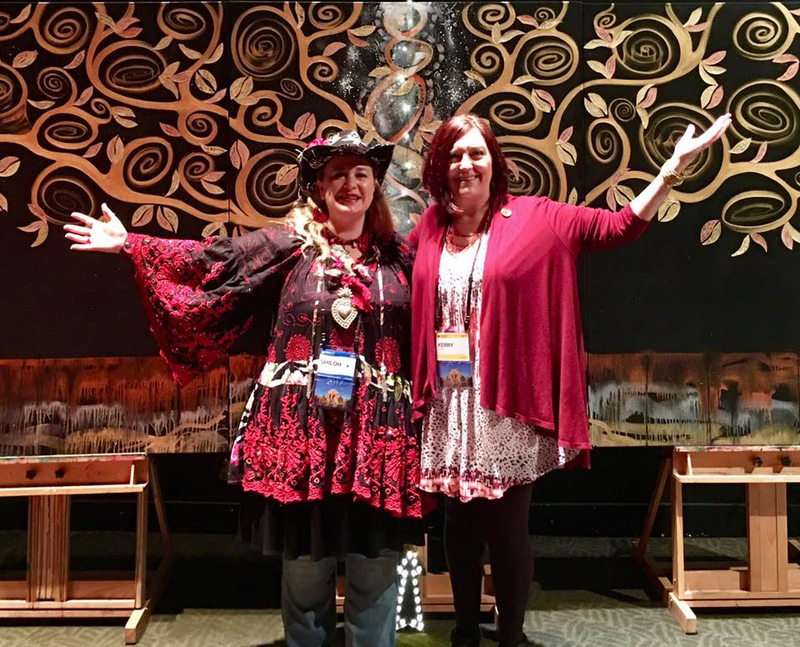 The 8’ x 75’ project is a collaboration between two women and two communities from the United States and New Zealand coming together to bring transformational beauty. The image design was inspired by Gustave Klimt’s style of the Tree of Life. 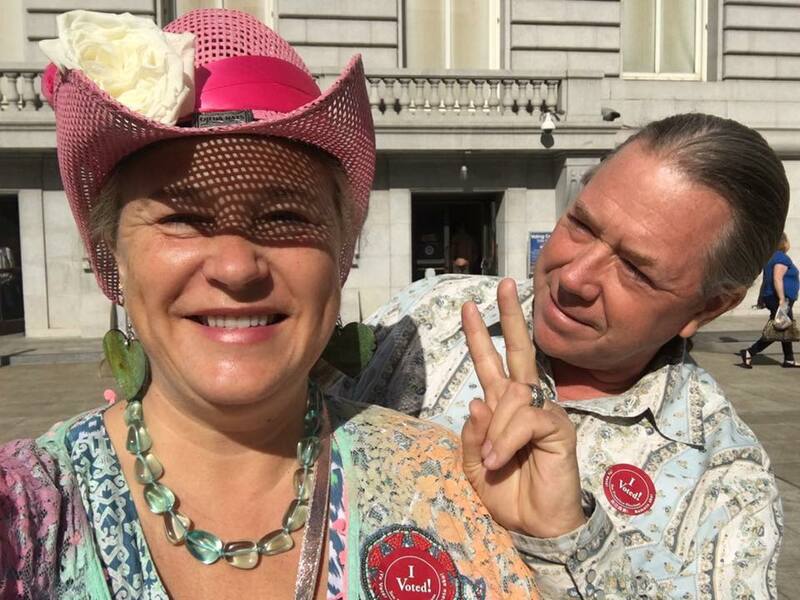 Shiloh Sophia McCloud was sparked by the spiral design as the foundation for the Witness Tree at Wisdom 2.0 Conference in San Francisco, CA in which thousands participated. Kerry Lee was part of the project and documented it on her blog here. Starting with the first tree of this kind in our community created in 2010 at Self Love Day in which many created leaves with their intentions and wishes. So many trees all over the world! 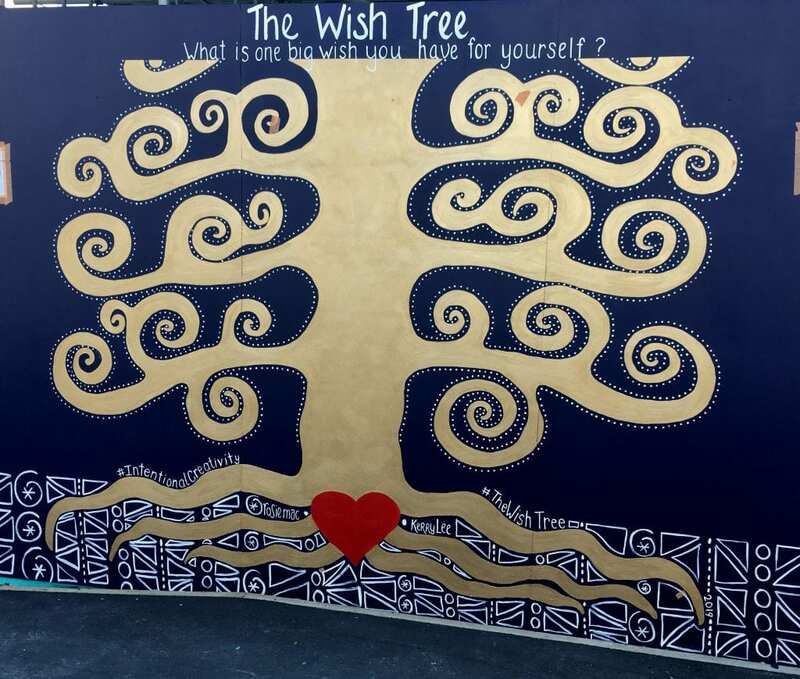 Artist Kerry Lee took the project to the next level with her 12’x16’ The Intention Tree mural at the First Street Artist’s Alley in Napa, California. Following these actions, this work became a part of Christchurch’s Enliven Places Programme because of Rosie Mac and her involvement with Intentional Creativity and her own community. Originally designed as a way to spark conversation, the mural soon became a healing balm for the recent tragedy, the first mass shooting in New Zealand. The project was designed by two Intentional Creativity Teachers, Kerry Lee of California and Rosie McCarthy of Christchurch. 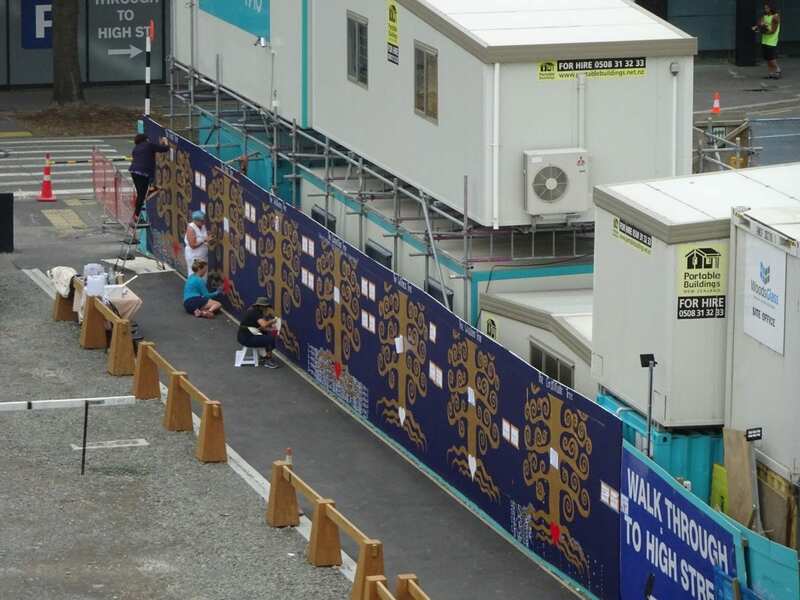 The mural is an interactive work of art consisting of seven symbolic and metaphoric golden trees. Where in Christchurch is your favourite place to be in conversation? How do you help improve the world? What is something you know for sure? Unique Contemporary Symbolism at the base of each tree ties into the overall themes including simple whimsical houses symbolizing connection, triple spirals representing balance, triangles symbolizing change and circles representing humanity and our oneness and more. Native New Zealand birds grace the branches and the general public’s responses to each tree’s inquiry are painted on the branches for viewers to recognize our commonalities and encourage conversation. Given the tragedy, the artists are adding white thumbprints to The Connection Tree representing each person who lost their life. The Artists were minutes from going to work on the mural, located in between the two shooting locations, when they received notice of the attack. They continued to paint the three week project on the days following the shootings. In support of community healing the unveiling of The Grove will take place on Saturday March 23, 2019 from noon until 3pm at 145 Westpac Lane in Christchurch. All are welcomed to participate. Will you be a part of supporting the project? Due to rain, sun too hot to paint on mural, graffiti and schedule changes, the project and the creators could use a boost in resources. Contributions are appreciated and can be sent here. The unveiling will be on Saturday, March 23, noon until 3pm. Learn more on Facebook and Instagram @ The Grove of Intention. 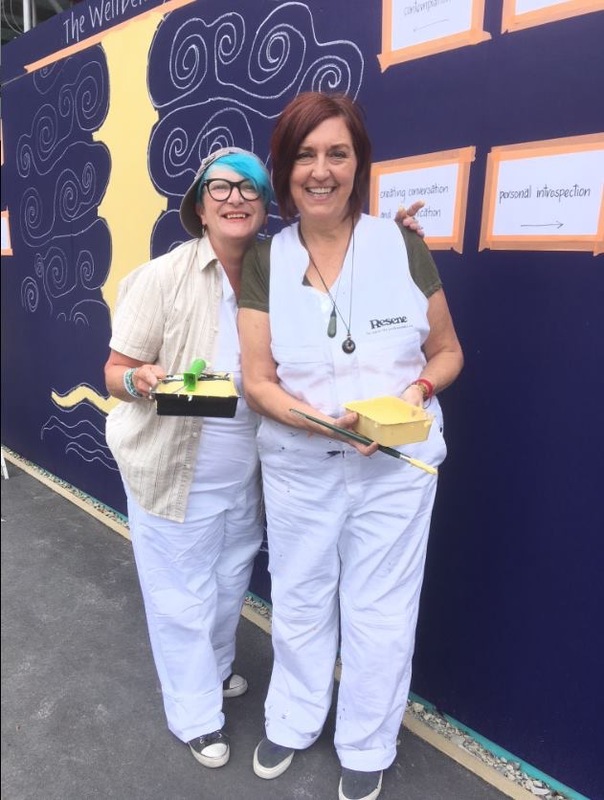 Rosie and Kerry have also been supported by a small village of people in Christchurch helping to complete the mural due to being hampered by the weather and, of course, the shootings last Friday when the city was in lockdown. About the Intentional Creativity Foundation: The Intentional Creativity Foundation is a community dedicated to creativity, connection, conversation, collaboration and change. We come from different geographies and genealogies. We seek to discover what makes us the same in the most basic ways and how we can be a part of something larger than ourselves while not lose sight of our individual visions. The Foundation is a place where we choose to participate in defining and developing a culture of heart and creativity – and how that has the capacity to transform our stories. The Intentional Creativity Foundation, Inc. is a Federally (USA) and State (California) recognized 501(c)3 organization. Message from Jonathan McCloud to the IC Guild – This is our internal call but thought we would share it with you too…. Recipe for Love and a Call to Action. Not now…. RIGHT NOW. What is it then, that we really do? Teach a class, move some energy, perhaps? Watch as the eyes of a woman, a veteran, an elder, a girl, maybe even a son… a human being wells with tears when they stand face to face with the story of truth that comes from within themselves as they move a stump of charcoal or pencil across a page. This magic of a method that you all know and love and live, it’s our way. You said it. You professed it. It’s here to knock on your imagination of the day when it would arrive. Hello. Our team is in need. Now. Rosie McCarthy braved the good fight and got a grant from her government to bring Kerry Lee to New Zealand to bring the message of Intentional Creativity and hope and peace and healing to a country tossed by the might of Earth and respectfully, softly healing with love and kindness towards one another. There are stressors in life that catalyze, through fear, the best and/or the worst in us. Let us not focus on the event, nor the actor. Let us focus on what it is that we, The Intentional Creative Foundation and you, it’s heart and soul bring to this moment, this lifetime of every soul, voice and hand. Be a part of this solution. For us, by us, and by our own hands. The same way it was when you stood before that canvas on the first day of LEGEND. This is you. This is Us. We are caring for our own and in the process, loving in forgiveness the entire being that makes this humankind. Let’s give these ladies, daring in the face of this adversity, at the front face of where creativity can and will heal, the ‘green stone of love’ as they say. Mighty in our connectedness, you stood for this, stand for it now. This is the Guild. Every bit goes directly to them as an Earmarked Donation to the ICF. We will make sure that you get full acknowledgment from the ICF, Inc. for your tax deductible contribution for this identifiable member(s) benefit from YOUR own Guild. Have I told you today, how much I love you? Your Advocate in all things.